Everyone has a theory – but for Sue Sill, there’s only one answer. 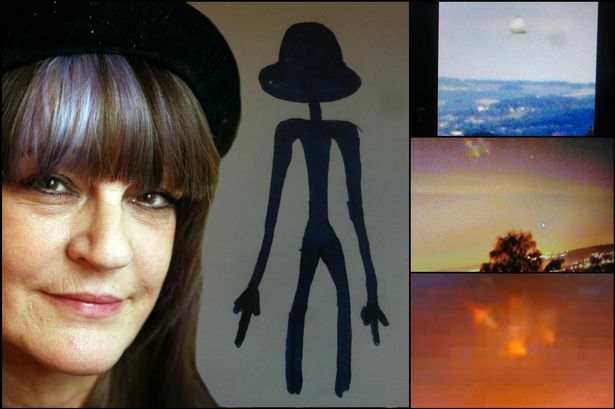 Sue, 57, of Outlane, claims she’s had many encounters with UFOS – and believes she was abducted in 2010. She says Huddersfield is a hotbed of activity and has filmed UFOs in the sky all around the town. Her latest experience was just last month, when she filmed a light in the sky above her home – watch the video below. Sue has been an avid UFO spotter for most of her life and in 2010 had an experience she describes as an abduction, around the same time crop circles were found at Castle Hill. A crop circle which appeared at Castle Hill in July 2010. She said: “I was sorting my things out for the morning and running a bath. I walked back into the bedroom and it was like I had gone into a trance. “I sat down on the bed and the next thing, some figures appeared. They were really small and they had black skin or were wearing black suits. “They came to the side of the bed and something like a veil came over me. The next thing I knew I was in a space on a craft looking at Earth.